These guys really have fun with this hacks. It was [Tom’s] birthday that prompted that hacktacular mini golf course. watch a video – would be correct..
watch videos – would also be correct.. I think the grammar nazi headquarters have an opening, you wanna apply ? Grammar Nazi board application rejected. “Video” is both a Mass noun and a Discrete noun. You can watch videos(a series of individual clips of moving imagery) or you can watch video(a raw mass of moving imagery). You fail, anonymous. ‘Watch video’ is akin to ‘hear sound’. You’re getting confused with the use of ‘video’ as a noun. I imagined the audio system was hooked up to other persons headphones that why they yell at you if you’re messing up their music when you start slacking off. free personal trainer/motivator! I love grammar nazi fails. There is nothing wrong with saying “watch video”. You wouldn’t say “listen to an audio” or “listen to audios” would you? It’s surprising. 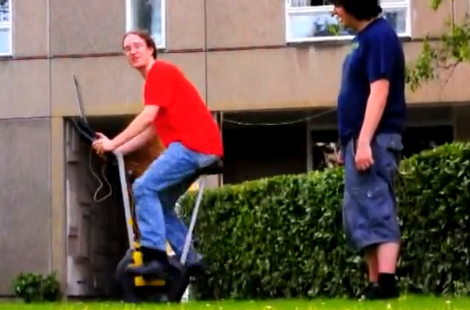 We can play music by a exercise bike?